Calcite is a mineral that occurs in many different colours and shapes. It has amazing properties and countless uses. You can try some of these out in experiments. Besides this, it can be found almost anywhere on earth and is admired by collectors for its diversity and the attractive shapes of its crystals. This mineral could be described as the wizard of form. Visitors can take a closer look at it in the Christmas holidays (27 December – 5 January 2014). Pure calcite is colourless to white but this amazing mineral can take on almost any colour, even blue, pink or black. As if this isn’t enough, it is also the mineral that takes on the largest diversity of crystal forms. On a tour through the exhibition, the children can search for the different forms and colours. 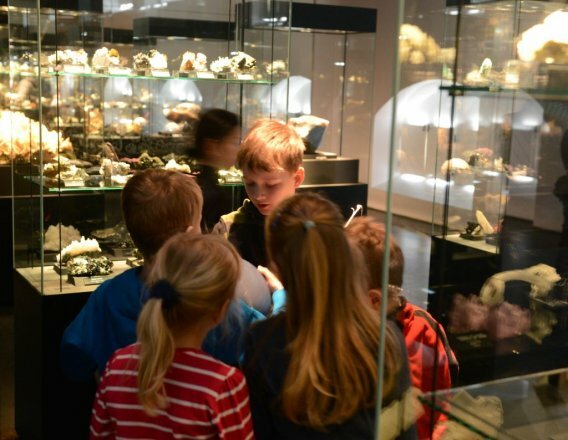 In the “Research Expedition” – the scientific centre of the exhibition – the children can get even more closely acquainted with calcite. What special properties does it have? How can one identify it? In which types of rock does it occur? What can it be used for? The girls and boys can draw up a profile of this special mineral. There are several experiments and examinations in which they can participate, which will help them draw up the profile. Calcite occurs in rocks such as chalk, limestone and marble, but also in seashells and coral reefs. Transparent calcite crystals are sometimes called “Doppelspat” in German because the optical phenomenon of double refraction is so distinct in such crystals: If you look through the crystal, everything appears double. The Vikings made use of this effect as a kind of compass to help them to navigate their ships. Even to this day, the effect is utilised in the optics industry. Calcite is also used as chalk, cement or concrete, as fertilizer for the fields and as a fluxing agent in metallurgy. terra mineralia’s Christmas holiday programme takes place from 27 December to 5 January, from 10 am to 5 pm daily. On New Year’s Eve and New Year’s Day, the exhibition will be closed. For more information, contact the Info Desk on: 03731 394654 or fuehrungen@terra-mineralia.de. During the autumn holidays, the terra mineralia exhibition at Freudenstein Castle in Freiberg takes on a fairytale flavour. 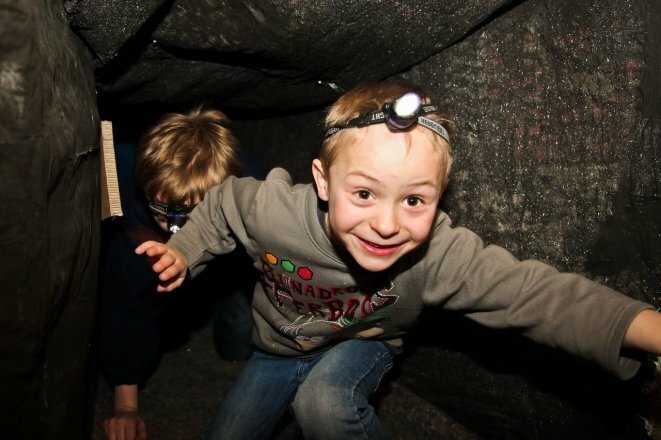 From 21 October to 3 November, visitors both young and old can go in search of the whispering stones. One of the speaking stones is hidden in each of the exhibition halls. The boys and girls can listen as the stones tell exciting stories of the fairytale kingdom of terra mineralia. King Aquamarine, the wicked fairy Flowers of Sulphur, the magician Calcitus, Princess Ruby and the copper smith all play their part. Those who listen carefully can easily answer the questions on the task list. Sometimes it also helps to take a look in the display cabinets, in order to take another look at the mineral in question. 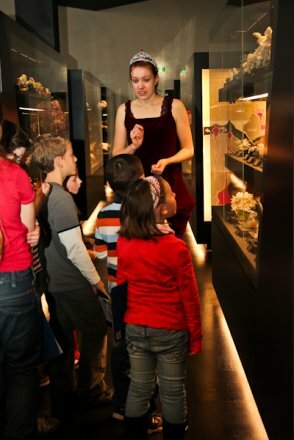 More excitement lies ahead after the tour of the exhibition, when the guests take off on a journey of discovery in terra mineralia’s science lab. Here, the fairytale characters are waiting in the flesh to carry out various experiments with the young guests. For example, what makes King Aquamarine into a gemstone? 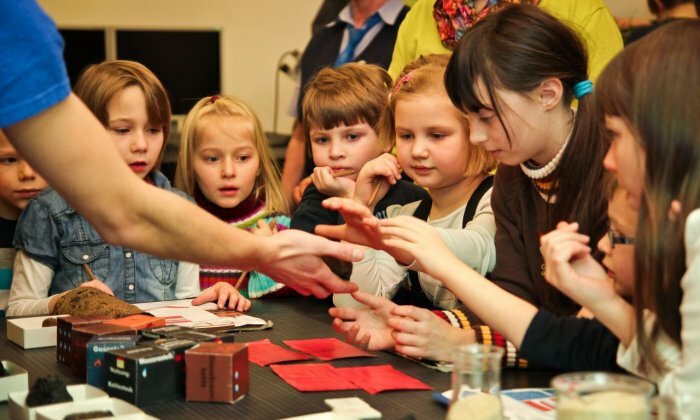 Students of the TU Mining Academy, Freiberg explain the properties of gemstones to the children, and they can test them for themselves. The wicked fairy Flowers of Sulphur can often be recognised by her typical “aroma”, and there’s an experiment that proves this. The magician Calcitus on the other hand, is a wonderful mineral that can be found all over the world. In the form of calcite, it is found in many types of rock and can be identified with a simple test that can be performed by all prospective geologists. In this way, children learn to recognise rock types such as marble and limestone in a fun way. Every child knows that Princess Ruby is one of the gemstones. But some of her rubies don’t only sparkle in the sunlight! They also glisten in the dark. 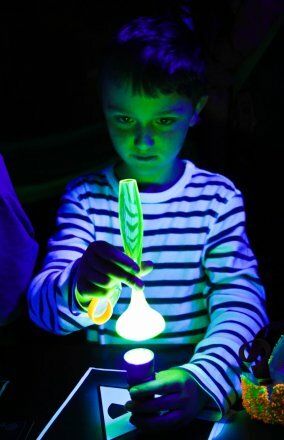 Whilst on the journey of discovery, guests can find out exactly what secret lies behind the phenomenon of fluorescence. The copper smith is a mineral that conducts electricity very well, therefore he is used in many electric cables. With the aid of the potato battery, he can show the children how well this functions. At the end of the fairytale tour, each child receives a medal to pin on his/her breast, and take home with him/her. Deep Impact – Can stones fall from the sky? 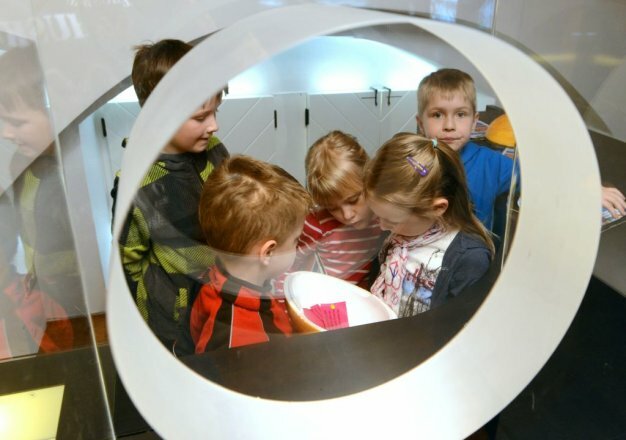 “Deep Impact – Can stones fall from the sky?” That’s the name of the holiday programme of the permanent exhibition,terra mineralia, of the TU Mining Academy,Freiberg which will be on offerfor school children during the summer holidays in Saxony.The girls and boys will track down meteorites, asteroids and other heavenly bodies, and learn exciting things about the objectsthat fly through the cosmos. Meteorites consist of rock and minerals. They can be microscopic in size or destructively large. When they fall to the earth, they begin to glow – and we see a shooting star. But where do all these rocks, whetherbig or small, come from? 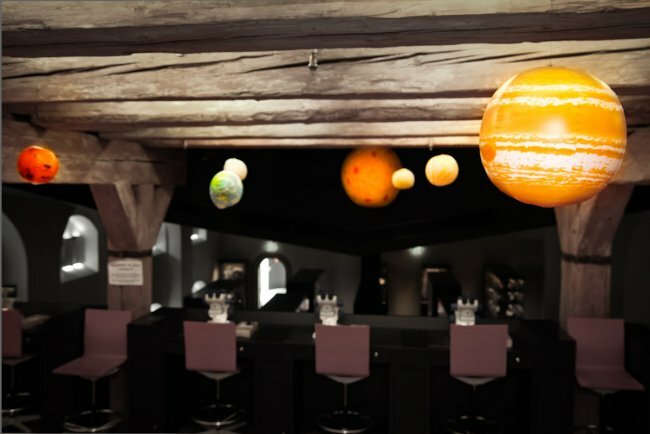 On this “expedition”into the scientific centre of terra mineralia, young space enthusiasts will learn about the structure of our solar system. Thereby, the size of planets and their distance from the sun plays a huge role. The children will also learn which heavenly bodies, apart from meteorites, can be seen in the sky. For example, what is the difference between a meteorite, a comet and an asteroid? However, one of the most interesting questions is what happens when a meteorite hits the earth. Why do meteorites create craters? How big can they be? What rocks and minerals are formed during the impact? Descriptive models help the children to understand the dramatic events. At the end, the question arises:What does our moon have to do with meteorites? During the “expedition”, a real meteorite from the moon can be admired, touched and examined in the meteorite room. The questions, “Who tossed it onto the earth?” and “Why does the moon seem to smile at us at night?” will fascinate the children. 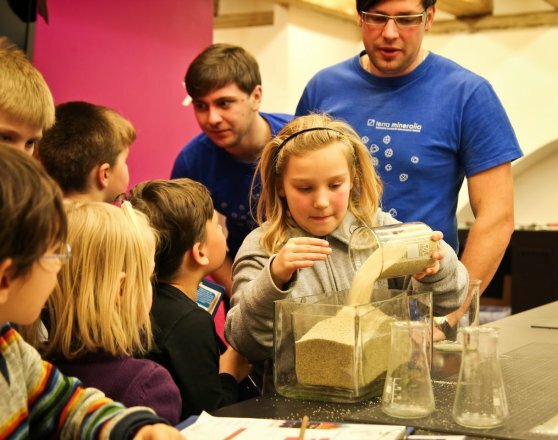 And the young researchers will also learn how scientists can tell whether they have a meteorite before them, or simply a stone from earth. They will also learn what types of meteorites there are. 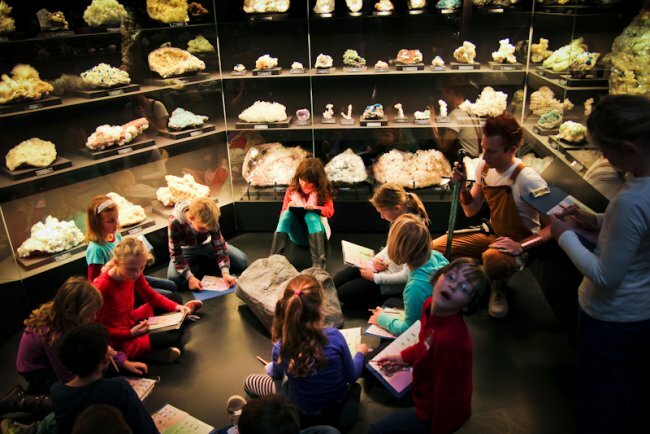 Children’s day at terra mineralia takes place over a whole weekend: on 1st and 2nd June the girls and boys will experience a day full of minerals. The programme “A day full of minerals” describes the daily routine of a child based on selected examples. Six situations will be put under the microscope from a mineralogical point of view in six sections of the exposition. “Most of us aren’t aware that we are surrounded by minerals at every hour of the day and night. Of course not by such beautiful samples as displayed at the terra mineralia exhibition but processed as raw materials”, explains Anna Dziwetzki, Head of terra mineralia children’s programme. It begins in the Americas Hall. Every day begins anew with the ringing of the alarm clock. The quartz crystal from the quartz clock plays an important role here. Because its electric oscillations set the pace of quartz clocks. Because the most beautiful quartzes were found in South America, here the children will embark on a search for the differently coloured quartzes. It continues in the Asia Hall. Here, the children will focus on a mineral which they know from school. Calcite and gypsum are components of chalk. The effect of the chalk – the drawing of lines - is an important property for determining minerals. After school, in the afternoon, children arrange to meet up with friends to play. Nowadays the mobile plays an important role in this. But who knows that there are more than seven minerals in such a small phone. Many of these minerals come from Africa, so they will learn more in the Africa Hall. Also on the way home we trample on so many minerals. Each paving stone consists of typical rock-building minerals. But not every rock makes a good paving stone. Therefore, at the “expedition” – the scientific centre of the exhibition – we will try to find out from which rocks good paving stones can be produced. In the evening, before going to bed, every child should brush his/her teeth. Teeth are the hardest material in our bodies even before bones. And how could it be otherwise than that they also consist of minerals. In the Europe Hall, the children will find out which exactly these are and what the minerals do in our bodies. After a day full of minerals it may well be that they will even dream of them. Then they will take on fantastic shapes. The most beautiful and extraordinary of them can be found in the Treasure Chamber at terra mineralia. Here there are silver hairs, golden globes, and even a king’s throne – all out of minerals. 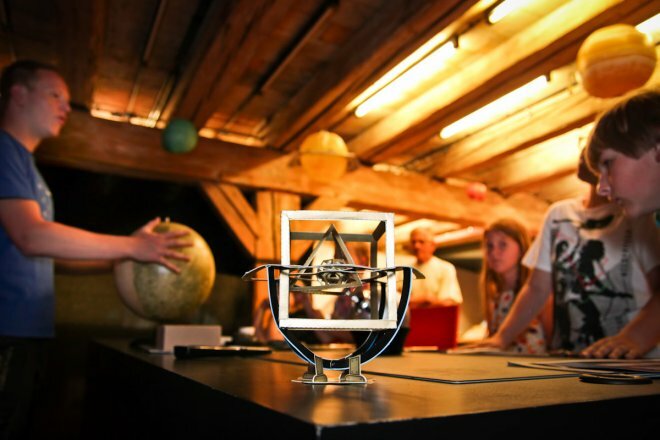 Students of the TU Bergakademie Freiberg will be on hand to the children at various stations with help and advice and will thus accompany them through the day full of minerals. 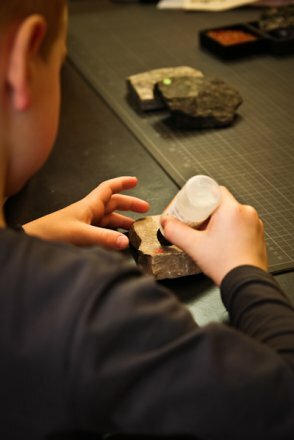 At terra mineralia, the Foundation Collection of TU Bergakademie Freiberg, it will be dark and bright at the same time for the children’s holiday programme during Ascension (8th – 12th May) and Pentecost (18th – 22nd May). In “The shine of minerals” everything about luminescence, i.e. the luminous effect of minerals will be explained. 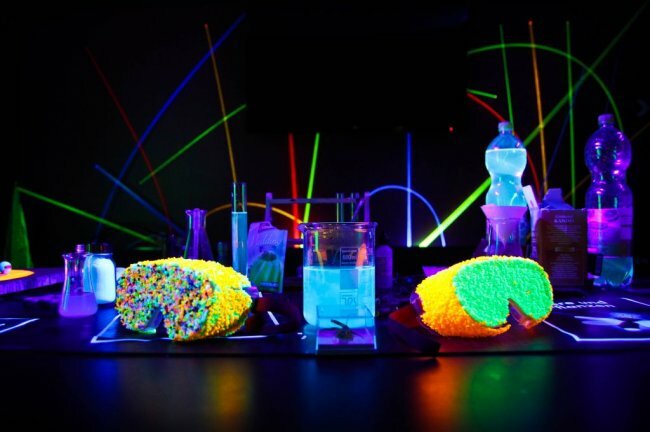 First and foremost is will be about the special type of light emission called fluorescence and describing the cold shine of minerals, which is irradiated with a special light. The “Journey into the light” has been created for this at terra mineralia: a darkened room in which special minerals are exposed to ultraviolet light. “This part of sunlight has such high energy that it causes sunburn in humans; but it encourages the shine of some minerals. The children will be able to observe which mineral fluoresces in which colour”, Christina Seifert from terra mineralia gives us an outlook on the holiday programme. 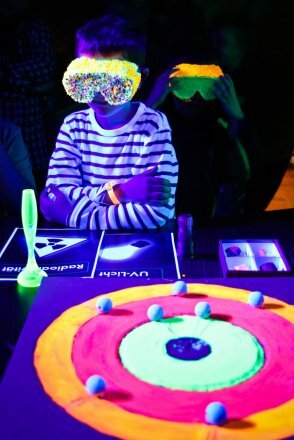 At the “expedition”, the scientific centre of terra mineralia, the girls and boys will be able to get to the bottom of the fluorescence phenomenon. With help of a touch station and dark glasses the children will be shown that without light you can only feel minerals but cannot see them. But what exactly is light? What does it consist of? And where does the ultraviolet light that is invisible to humans come from? Why do we see the fantastic colours of the minerals? These are some questions to be figured out before continuing to the “dark room”. 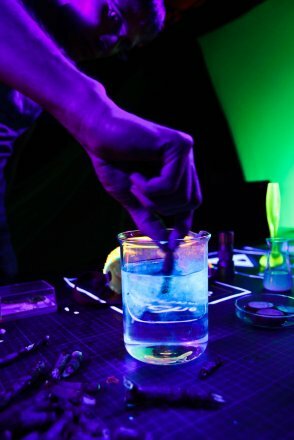 As an extra to the topic “The shine of minerals”, a part of the “expedition” will be darkened so that experiments can be shown in black light. Because not only light, but also heat, mechanical power, radioactivity or chemical reactions, and even animals can trigger the luminescence. There will be demonstrative examples of all these points to marvel at and participate in. By the way, the effect of fluorescence is named after the mineral fluorite. It was first described by Professor Friedrich Mohs in 1824 in Freiberg. The holiday programme „The shine of minerals“ will take place from 8th – 12th May and 18th – 22nd May from 10am – 5pm. Day care groups are requested to register. For further information please contact the registration desk 03731-394654 or fuehrungen@terra-mineralia.de. The name of this year’s Easter holiday programme at terra mineralia is “Eierlei“. 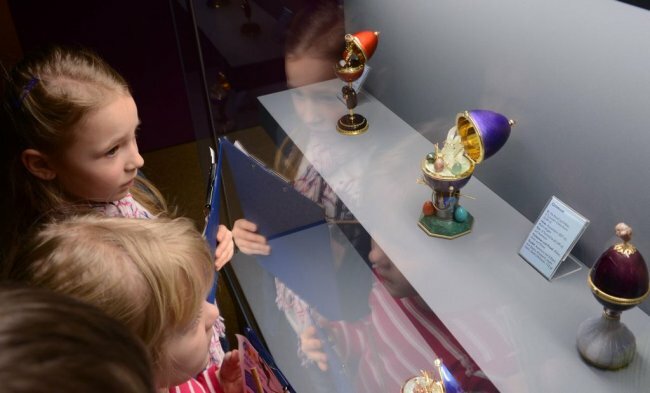 It fits the special exhibition “Valuable Egg Creations” which can be visited until 12 May, like a glove. It’s all about gemstones. The secret behind “Eierlei” is an Easteregg treasure hunt, at the end of which participants receive a gemstone code. 14 enormous eggs have been hidden all over the exhibition. They contain clues and questions about gemstones. If you can find the right exhibit in the show cases, it’s easy to answer the questions contained in the eggs. And what do you get in return for the gemstone code? 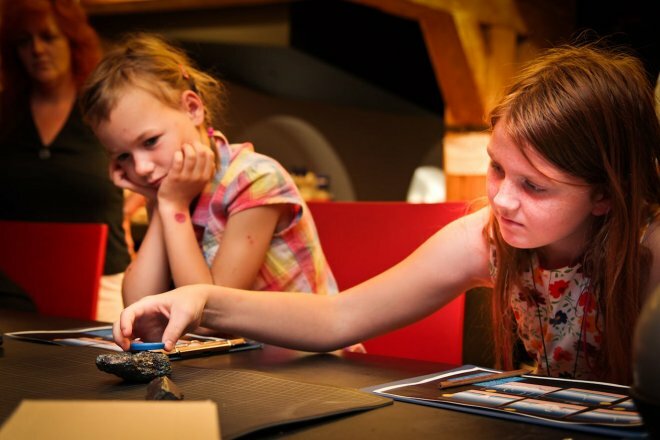 A gemstone generator is already waiting for you in the “Journey of Discovery” – the scientific centre of the exhibition. The boys and girls can give in their codes here, and if they are correct, the generator will produce a gemstone. Then you need to identify what gemstone you are holding in your hand. Just like real mineralogists, the children can determine characteristics such as colour, streaks, flaws, lustre and much more. The children can perform and test the identification process entirely on their own. Students of the mining academy in Freiberg will be standing by to help until the riddles have been solved. In this way, children learn exactly what a gemstone is, why some minerals are described as gemstones and others not and the secret behind the unit of weight used for gemstones – the carat. A “carat scale” even shows how many carats a person weighs. You will also learn the difference between the carat as a unit of weight for gemstones and the carat as an indication of gold-content in gold jewellery. And finally, you will also learn the difference between white gold, yellow gold and red gold. 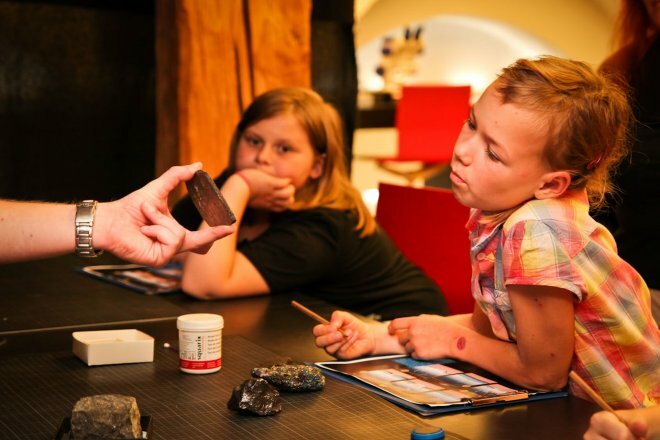 At the end of the holiday programme, visitors can try their hand at polishing minerals. Uwe Thonfeld from Geyer will visit us once again and will show the children how they can make a piece of raw agate glisten. terra mineralia visitors pay EUR 2.50 for the polishing course but if you don’t have a terra mineralia ticket, you pay EUR 4.00. On Easter Sunday, you can join others doing handwork with gemstones. Gemstone trees, leather bracelets with gemstones, flower pots for Easter grass or gemstone eggs can be created. terra mineralia’s Easter holiday programme takes place from 29 March till 7 April, from 10 – 17h every day. Groups of children and after school care groups are requested to register for the holiday programme. Panti, the little dinosaur explains to the children how coal is formed. From 2nd to 17th February 2013, at terra mineralia, girls and boys go on the search for a very special rock– coal. In the new winter holiday programme they plunge into the carbon age and learn about some of the plants and animals. One of them is Panti, a small Pantelosaurus Saxonicus. He lived about 300 million years ago here in Saxony. 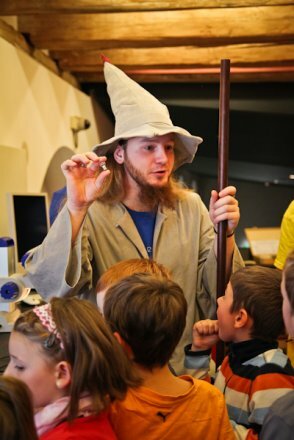 At terra mineralia, the permanent exhibition of TU Bergakademie Freiberg in Castle Freudenstein, he will tell the children how today’s coal deposits were formed from primeval forests. Giant horsetails, ferns, marches and swamps, huge dragonflies or mighty millipedes – all belonged to Panti’s world. However, in the course of the millennia, coal was formed in this environment. In fantastic experiments, the visitors can reproduce this process – coalification - which turned plants into coal. Thanks to Panti, the girls and boys will also learn that all coal is not the same. He will teach them how to distinguish different types of coal according to colour, carbon content, or water content. Most children know that coal is used primarily as fuel nowadays. However, Panti found out how versatile this raw material is and what opportunities it offers and passes his knowledge on to the little ones. “In order to really attune to the topic of coal, they can slip into the specially built coal bed as coal miners and find out how tight and narrow it is underground. Moreover, there is also a lot for them to discover in the coal seam,” says Christina Seifert, employee of terra mineralia. 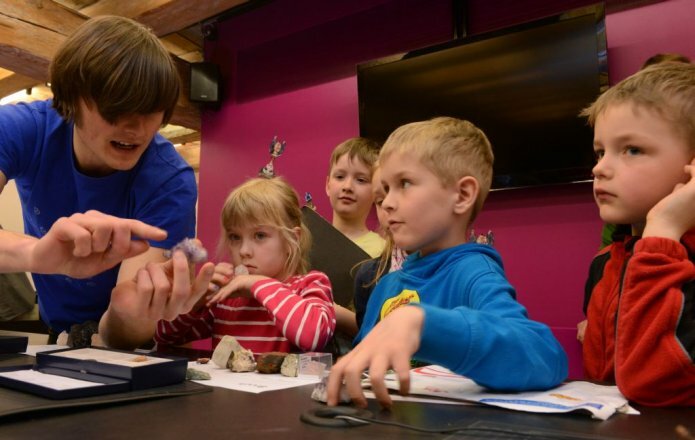 “At the touch stations, for example, the children should feel what can be found in a coal seam.” Next to plant imprints and animal fossils, there are also minerals, many of which the young visitors have already seen at the exhibition. Now they will guess which ones were discovered “underground”. As a reward and reminder of a fun and educational day, the children can create a indentation of Panti from black plaster at the “coal workshop“ and take him home. All children that participate in the holiday programme in a costume will receive a gift. Girls and boys who dress up as chimney sweeps, miners, dinosaurs, trees, horsetails or even coal will receive a colourful experiment for growing crystals and an annual pass to terra mineralia as a present. With this ticket all holiday programmes, special exhibitions, children’s events can be visited free of charge. On 14th February, as a special attraction during the children’s holiday programme, a puppet show will be performed, which will be thematically linked to the holiday programme. Among others, it is about the carbon era, a time in which coal was formed. The story of mammoth Helmut, who looks after the time machine of his friend the time worm Temporum, tells the children in a funny and exciting waywhat geological eras are. The mammoth meets unusual creatures on his journey, such as a scary dinosaur, a demented lungfish or the polar bear Urs and has many fun adventures. The Geo play is compiled by the environmental stage from Chemnitz. 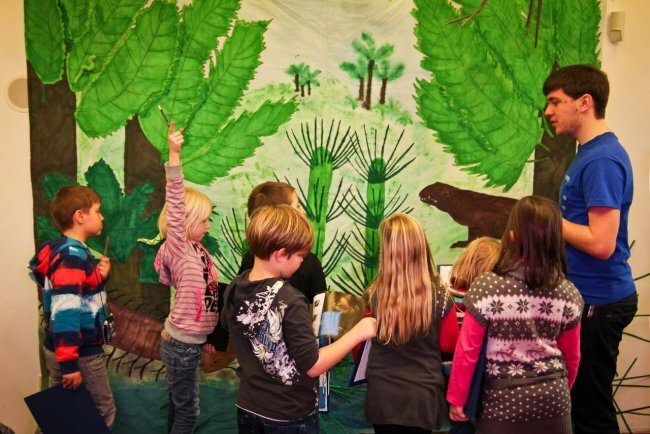 Since 1992, the environmental stage develops, produces, stages and plays professionally and affectionately designed puppet theatre plays for children who are in primary and preschool age (from 5 years), which should encourage a conscious observing and understanding of nature and the environment. The puppet show will be performed on 14th February at 11am and 2pm in the terra mineralia Lecture Hall. Afterwards the children can participate in the holiday programme. Adults pay 8 Euro, children 4 Euro for the show.